To understand what may be the winning strategies of the incoming market phase characterized by radical changes, it is first of all necessary to understand which are the main trends that affect the market in the near future. ● a “revolution” of the product development (and production / distribution) methods. The underlying factor in the disruption of the Market is a radical change in demand consumption – due to a disruption of consumption patterns – so profound that makes the radical change of the business paradigm inevitable. In other words, due to this factor, it is no longer possible to limit oneself to improving its operating methods and structures. But it is necessary to revolutionize oneself by developing new Business models, new ways of conceiving the product and structuring the company. (this applies to both the Market and the Government). 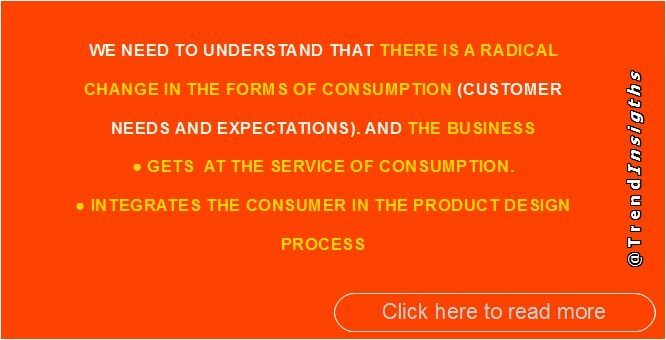 ● the Business gets (re-puts itself) at the service of consumption: this is a step backwards from the current business mode, in which it “induces” a need of consumption in the consumer that is not functional to the latter’s needs. In fact, in this way, the original Market Principle that has been lost over the last few decades is recovered: the Law of Supply and Demand. Now we apply a disrtuptive innovation ot that, thanks to the new feature described below. ● the Business integrates the Consumer in the product design process. It does so by putting in the hands of the Consumer tools that allow him to interact with the process of designing the Product. To better understand how this integration of the Consumer can take place in the conception/ production/distribution process, it is necessary to analyze the new characteristics of the emerging market. On this way a spontaneity of consumption is recovered (we overcome the idea of top-down induction of current marketing) which, among other things, leads to a recovery of Progress as a truly useful and sustainable innovation for Humanity.